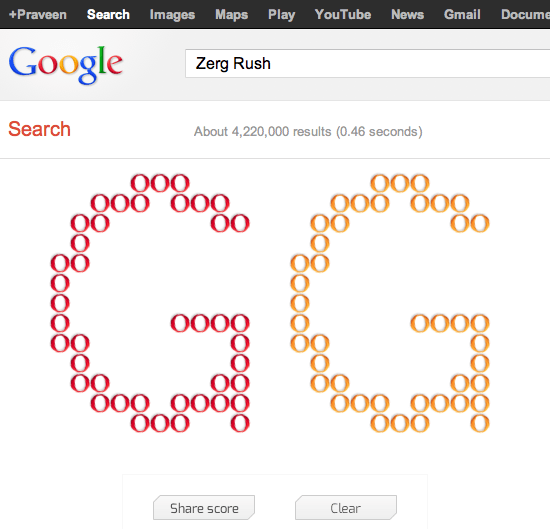 “Zerg Rush” is Google’s latest Easter Egg, and it’s first StarCraft-inspired one. Just enter Zerg Rush in google search box and hit enter.Hordes of red and yellow Google O’s will descend on your search results. You have to click them to knock down their HP before they defeat your search results. After every search result gets wiped out, and they will get wiped out, you’ll be assigned a score which you can then share on Google+. Google tracks the user’s actions per minute (APM) and zerg kill count in a score box on the far right of the screen. Once all of the search results have been eaten by zergs, the enemies gather at the top of the (almost) blank page to form two Gs. My score the first time around was 16 zerglings taken down with 56 APM (attacks per minute). Seems Amazing, zerg kill count in a score box on the far right of the screen. Hey Praveen, thanks an this interesting stuff. I like it.